There is real growth in Bermuda, but in the wrong place and amongst the wrong people. That growth is in Bermuda’s ‘Invisible’ Class (BIC). Certainly, we’d all agree that Bermuda’s Underclass has grown. Proof? The body count since the shootings started in 2003. Since then, Bermudians have accepted — some more begrudgingly than others — that Bermuda has ‘gangs’ and a gang and drug sub-culture present in every parish on our mid-Atlantic atoll. A few days ago, in a nice middle-class neighbourhood, we had our twenty-fourth — or is it twenty-fifth? … is anybody even counting anymore? — death by gunshot. Since 2003, we’ve had a very large number of wounding by gunshot, confirmed shootings, and reported shootings. Following police investigations and arrests, we actually see many members of this Underclass. Dressed in their characteristic bright orange or dull grey Government-issued uniforms, they parade through the docks in Bermuda’s Magistrates, Supreme, and Appeals courts. We support parts of this Underclass by paying their legal fees before they are packed off to reside in one of the three publicly-funded inns run by chief innkeeper Eddie Lamb and his large cohort of assistant innkeepers. So the Underclass exists. No doubts about that. BIC is new. BIC’s birth came about after a gestation period between 2004 and 2008. BIC’s birth happened in 2009 after Bermuda’s 88-year-old oversized successful economy began shrinking. Now, in its sixth year, BIC has started walking. For the first time ever, we saw some of BIC marching on May 1, 2014. BIC consists of blue-collar workers, white-collar workers, semi-professionals, and a sprinkling of professionals. Characteristically, BIC did not previously stand out and draw attention to itself. As they’ve been acting since 2009, BIC are invisible, faceless, nameless people in an amorphous crowd. 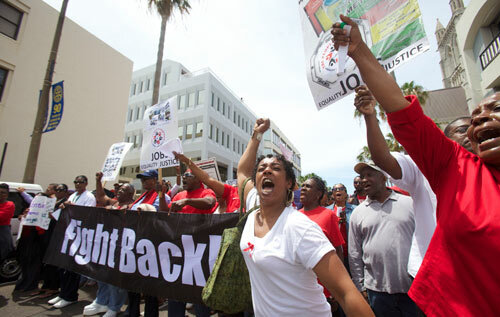 BIC contains Bermudians who, in this now almost six-year-long recession, have lost their jobs, seen their household incomes significantly reduced, fallen behind on their mortgage payments and their rents, have had to resort to asking their family for help, and some of whom have gone onto Government’s Financial Assistance rolls. But they remain invisible. Not seen lining-up at ‘Labour Exchanges’ or ‘Unemployment Offices’. Not seen gathering on street corners seeking work. But seen or not, they are. BIC exists. BIC is real. Bermuda’s 94-year economic history is one of almost constantly rising prosperity. From 1921 through to 2008 (87 years), Bermuda’s GDP and general wealth grew and grew and grew. In 1981, tiny Bermuda’s GDP per capita was at parity with that of the mighty USA (around $13,500). By 2008, tiny Bermuda’s GDP per capita was up seven times to $93,600 while the mighty USA’s was up only three-and-a-half times to $48,400. In 27 years, tiny Bermuda’s successful oversize economy had built up such a ‘head of steam’ that, like our CARIFTA medal-winning Kyrah Scraders racing Barack Obama, tiny Bermuda had shot past mighty USA. Then, in 2009, Bermuda’s oversize economy started shrinking. In 2009, BIC started growing. With no history of mass unemployment, Bermudians who became unemployed obscured, concealed, or even pretended that they were not unemployed. Bermuda’s long history of being a successful oversize economy with a small (12 per cent) to large (36 per cent) presence of Guest Workers, means that this new phenomenon of unemployment for Bermudians happens in the strangest of circumstances. Unemployment for Bermudians happens even while 9,773 (in 2013) Guest Workers are on-island and working. Some find that strange and wrong. Many think it unacceptable. Many voices in Thursday’s ‘red crowd’ spoke of the unacceptability of having Guest Workers employed while Bermudians are unemployed. BIC is angry. Rightly so. But in this fuss about jobs and pain and losses and fears, Bermuda’s oversize economy is the one thing that stands out as something not understood. No one really understands, or knows, really, exactly how Bermuda’s fragile, complex, and sophisticated economy really does work. Not the Government. Not the Unions. Not the Chamber of Commerce. Not any Bermudian organization that is involved in Bermuda’s economy. Certainly not the people in BIC who are hurting every day. But will knowing fix BIC’s problems? No, not directly. But BIC’s overall problem — not enough jobs — cannot be fixed until they know, we know, and the Government know what the problem is. Today, BIC are dealing with an IP (Invisible Problem) that no one understands. This makes fixing it difficult. So BIC’s pain, hurt, and losses will continue.